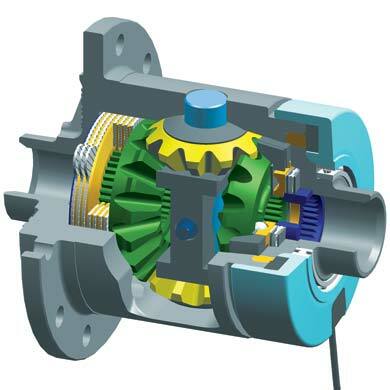 Auburn Gear-Ected Electrically Activated Differential, Ford 8.8, All Ratios, 31 teeth. The ECTED (Electronically Controlled Traction Enhancing Differential) operates by the flick of a switch. When selected "on", current is sent to the electromagnetic coil which creates a magnetic field that compresses and engages the clutch pack to give the user a solid axle assembly- locker performance for off road use. When "off" the clutch pack provides a limited slip mode. As torque increases the clutch pack is compressed and thereby providing bias torque to the high traction wheel-your performance limited slip differential action which is for daily driving and moderate off road situations. Can be switched on or off "on the fly" at any road speed. Made from aircraft quality 9310 heat-treated billet steel to make it as tough as nails! ECTED Locker comes complete with wiring harness and switch.